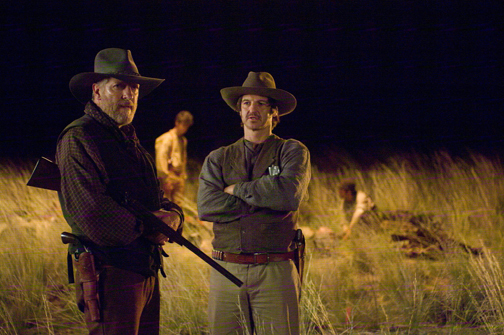 Putting horror in the old west creates a completely different sensibility. Most horror films tend to have an urban sensibility or sends urban characters out of their comfort zone into rural areas. But when you put it in the old west it completely changes the character of it. The frontier is the unknown already for settlers. You don’t need monsters or supernatural forces to add to the natural terrors that awaited the settlers in real life. I’ve said this in other interviews but I think it’s a valid point: for Euro-centric settlers in the 1870s and 1880s, the old west was science fiction. Like the Native American cultures and the landscape, which is used for science fiction movies still. If you want to shoot Mars, you shoot the same place Ford was shooting all his westerns. And the animals, like rattlesnakes and bison and all these things that look like made-up animals. And the landscape itself can be beautiful, and then the sun goes down and it’s completely alien. It’s like the perfect mixture of epic and intimate for the horror film or science fiction. And you can do that whole thing with, which I guess westerns play with all the time, the difference between being that alone and in that epic a landscape. Did you turn to any films for ideas or inspiration or imagery? I see the savagery of Ulzana’s Raid echoed in yours. Yeah. And it has that feeling that Burt Lancaster is like a guide to an alien territory. And how out of place the soldiers are. Missouri Breaks is a big one, for some of the sense of humor of that movie. You could go on forever, there are so many great westerns. But you turned to westerns as opposed to horror films for reference. Yeah, largely. Once you’re in the trope of horror movies, people pretty much know what’s coming, whereas with westerns I think modern audiences are quite as fluent, so they can be a bit more surprised when the monster shows up. And also, all the monster stuff I’m already using all the time. The Thing and Alien and all the great monster movies are pretty obvious references, but those are just part of my vocabulary, it wasn’t really a stretch to try to include that stuff. Recent American western fiction has not become horror, per se, but it has become much more open to the idea of the west as a potentially horrific place, where demonic things can happen. I’m thinking in particular of Cormac McCarthy, but even in Larry McMurtry’s westerns, the dangers come from the way life is lived, from the sudden violence of desperate people in a wide open territory and from the landscape and wilds itself. In Louis L’Amour’s Conagher, a guy is riding home from a long trip from his homestead to the town when his horse steps in a gopher hole and breaks its ankle, falls on over on him, pins him down and kills him. That’s the opening of the story and his wife never finds out what happened. That’s just the life out there. I think Lonesome Dove has that scene where a guys falls into a river of adders, where the water itself is boiling. Annie Proulx does that stuff, too. It’s just the amazing cruelty of nature. It’s great. A lot of the fun of doing The Burrowers was the amount of research involved, because there’s an amazing amount of writing from that period. Anyone could basically sell their diary because everybody back East was paying attention to the West. But they’d talk about all the exact same kind of things, that it’s such a common occurrence to lose a finger or lose a child or your husband dies at the age of 25, and from things that you wouldn’t really see coming, like disease and infection and the ways people die outside of civilization. 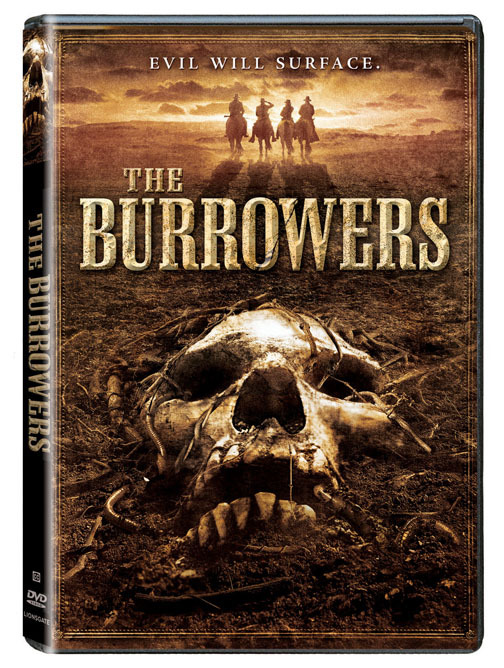 In keeping with that, the monsters of the film, the burrowers, are not something supernatural or alien, but rather part of the natural eco-system that human intervention has destroyed before they ever really knew about it. Exactly. I was influenced a lot by the way the 17-year locusts work, where these things hang out underground and then twice a generation come up and eat and then go downstairs and sleep again. I think it just is interesting. And was important that they weren’t demons or some sort of supernatural nightmare like that. I like the idea that the world can continue in balance until the settlers show up. And you see some of that in the arrogance of the cavalry, which has a very rigid idea of what things are and how things work and no amount of evidence to the contrary is going to dissuade them. It’s the attitude that allows it to happen. I think that’s a classic military view, or even just a human view. It oftentimes does work but you’re always trying to after the enemy that you know. I like the frontier sensibility that Will Parcher and John Clay, the characters played by William Mapother and Clancy Brown, represent. These are actors guys that often play villains and they look and act like people who know what they’re doing. They understand the dangers of the frontier and they are very competent, which is an essential value in the old west. They know their world, they’re comfortable in it, and they don’t rush blindly into a situation without taking stock of it first. Although even them, because they have a history in the West and they have expectations, that’s ultimately what leads to their downfalls in the movie. I think William’s character is certainly more adept than the military and more open to new ideas, but he is ultimately tied into the idea that this is an Indian tribe thatâ€¦. I liked the idea that the people who are actually able to save the day in the end, or at least survive, are the ex-slaves and immigrants, just because they are outside this world, so when something outside of expectation happens, they are able to see it for what it is. The other thing about William and Clancy is that they look like they’ve been working their whole lives. And that’s so hard to find in Los Angeles actors. You get so many people who only make sense on soap operas now because they’re 555 and look weirdly ageless. But both those guys, they get on a horse and they make sense, they’ve got hands the size of baseball mitts, they look like working men. In the beginning, when Mapother is trying to teach frontier life to the son of his girlfriend, he brings real authority to the seen because he looks like he’s teaching from experience. And he’s also very respective of the world and the way things work. He’s a great actor and he’s really good at showing calculation behind what he’s thinking. There is so much internal process in his performance. One thing that all three of these films have in common is that they take familiar, otherwise comforting settings and surroundings â€“ the lovely autumnal countryside in Soft For Digging, someone’s own city neighborhood as seen outside their window in Mimic Sentinel and the plains of prairie grass and forests in old west here â€“ and you completely alienate the characters from them. You turn the landscape into something alien, something mysterious and threatening, the known becomes unknown. I think mood and tone in horror is easily half the game, just like what Toby Hooper does with Texas in The Texas Chainsaw Massacre or the arctic base in The Thing. If you can get your landscape to work for you, you’re so far ahead. I think that’s missing from a lot of horror films today. I think that a lot of modern horror directors forget that mystery is scarier than the reveal. Yeah. It seems like we’re still in a pornographic period of horror, and I don’t say that in reference to the torture stuff, because I think if that kind of depravity is used well, it can still be interesting. When I say pornographic, I mean nothing matters except the quality and amount of violence, where nobody is reviewing horror films in terms of the story and characters because they’re just saying, ‘It’s just a horror film, none of that matters.’ And I think that’s incredibly damaging to the genre. And I think what some hard-core horror fans could even be turned off by in The Burrowers is that I’m obviously more interested in characters and plot than the kill. Even when you reveal your creature, you still keep them shrouded in darkness. It’s more edges and corners and weird bends and limbs. When you see the face, you see a giant mouth but not much else. I was trying to get across how you would react to a wild animal out in the wild at night. If you run into an animal, you’re just seeing a flash and it lets your imagination do so much more. And I think it’s also more interesting just seeing how people react to it as much as the creatures themselves. I love when they come upon the holes where there once were buried people but there is now just blood and bone and sinew and it looks like something that’s been half-digested, like the Earth has been devouring a person and leaving the wasted behind. Very organic and very weird and disturbing. It’s scarier than the monster because it’s beyond comprehension and leaves your imagination racing. And it ties in to ideas of being buried alive and eaten alive and all that good, terrible stuff. The biology and methodology of the creature was conceived months before the actual physical design came about. It was all about their process. There’s a little bit of spider there, catching its prey and wrapping it up in a web to eat later. Exactly. There’s a lot of spider and naked mole rats. The komodo dragon is not fast enough to actually catch and kill things so it just bites them and lets them go and its mouth is so filthy that they’ll die of infection within a few a few days, which is such an awesome example of how cruel nature is. You bite something once and then walk slowly after it for the two days while it gets sick and dies. There are so many examples of that. When I see the creature, I see an unholy melding of lizard and insect. That was the whole naked mole rat thing. Those are mammals that live like insects and dig through the ground. But I love that idea that, especially in nature, a pack of animals can be so much scarier than one big single dragon. Those backs legs look like grasshopper legs, like locusts. Grasshoppers, locusts. We were thinking about how one of these creatures could actually drag something down and that was the creature designer Rob Hall’s idea, that if we turned the legs around, we could believe it digging into the ground, moving forwards or backwards. And also, when you’re looking at it from a distance, you just see a thing moving through the grass. Once we turned the back legs around, you really weren’t sure that you’re looking at when it’s out in the grass. It just becomes a strange organic shape out there which was important. I wanted to be able to see it without really getting your mind around what exactly you’re seeing. So where did the idea of the creature burrowing under the ground and coming up to attack come from? I think that came about partly from the whole thing that I knew I wanted these creatures to bury their victims alive. Putting them underground was a big part of it. It’s also probably part of me trying to make that landscape the right landscape for horror. When I think about those endless plains of grass, I wanted to treat it like the ocean in “Jaws.” It’s so amazing in “Jaws” that, after they establish the shark is out there, anytime that they’re on the water you’re waiting for this thing to show up and eat somebody. I wanted to treat the grass in The Burrowers like the water in Jaws. And once you’re there, your creature and big and underground, or crawling through the grass. I love the fact that the grass rustles but the wind is not blowing. (laughs) Yeah, there’s a lot ofâ€¦ With the sound designers, we spent hours going through different grass rustling noises. We had a catalogue of different levels of animosity in rustling noises, we had scary bugs and peaceful bugs and daytime bugs. It was great fun. The sound in Soft for Digging is superb. You create more unease and alienation by pushing natural sounds up to unnatural levels, distorting the familiar. That’s basically me watching Eraserhead once a week for my entire teenage years. Especially when you get rid of all the dialogue, you’re leaving people listening more acutely because you’re just waiting for some kind of sound that’s going to tell you the story. So I think it just sets it up a lot more to make people actually listen. Do you have any favorite examples of the horror western, or anything that jumps out at you as an interesting horror western? I love all the old samurai feudal Japan movies, which visually share so much with westerns. What’s that black-and-white anthology of 18th century Japan? Ravenous is the only big horror western that I could name that I really like as a movie. Near Dark is also good but it is weirdly more of a crime movie than a vampire movie, it’s a guys on the run movies with vampires in it. I like Dead Birds pretty well. I think there’s certainly some weird stuff about it but it’s a good movie. It’s Civil War soldiers on the run and they hole up in this house that’s got a demonic entity in it. The Boogens I like pretty well. I think that’s a horror western. It’s definitely mid-eighties Creepshow era horror that I loved when I was twelve. I haven’t seen it in a decade but I feel like it’s still got to be pretty good. I’m a fan of Tremors but that’s a comic horror and a modern western. I’ve got a knee-jerk sensitivity to Tremors because as soon as everybody heard about The Burrowers, they assumed it was going to be Tremors again. It’s also worth bringing up Pale Rider and all those semi-supernatural actual westerns. I think there is a lot of really interesting horror in a lot of those. I think there is a sense of horror in a lot of westerns. You mentioned Ulzana’s Raid and that takes place in the bright light of the desert sun the whole time and still it’s stark and savage. The seventies really did bring a whole knew sensibility of the western and confronted the idea that the frontier was a very dangerous, savage place. Maybe that’s why there have been so few horror westerns. There is so much natural danger that who needs to bring in monsters? I think it’s also that, in the last twenty years, it’s been hard to make a serious western. And even something like 3:10 to Yuma has a certain level of self-consciousness to it. Not really overt irony there but you can tell this guy is playing dress-up. And to make a horror film that anyone’s actually going to take as scary, everybody’s got to be taking it seriously and everyone’s got to be thinking that they’re actually living there. Because if you’re not invading somebody’s home, you’re not really making a horror movie. And so it’s like, if you’re going to have that much trouble just making a western to start with, it takes an amazing amount of conniving to get any kind of horror western made. I love this entry on The Burrowers. It seems I am in the minority of film goers that experienced Petty’s film as a brilliantly atmospheric nod to the austere and brutal landscape of the west infusing the elements of the horror genre. Both are so richly compatible and I think he did an excellent job of capturing this sensibility. It had a rich underlying sense of irony, while laying the groundwork for an effectively creepy piece of work.